Long-time city manager Dr. Carlos Urrutia has been advising and providing services to a number of highly-satisfied clients, since his retirement. Solving problems through win-win solutions produced great results during his 35 years in local government and works equally well in consulting. Access years of experience in public infrastructure, public finance, land development and organizational structure. 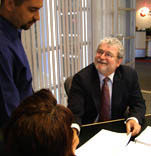 Dr. Carlos Urrutia's approach is to help clients identify fiscally- sound solutions that produce win/win results. "I have worked with Carlos for over fifteen years on land development and public finance projects. His knowledge and experience with local government, land development and public financing options has been a tremendous advantage in getting our communities and projects constructed in a timely and cost efficient fashion." Browse the press releases below to see Carlos Urrutia Consulting's recent solutions and collaborations.